In the days following the celebration of the Tibetan New Year, Yungdrung Bön monks studying in the dialectic schools will undergo a retreat in order to practice the deity of wisdom, Mawé Sengé. This is done in order to support and increase their intellectual capacity. 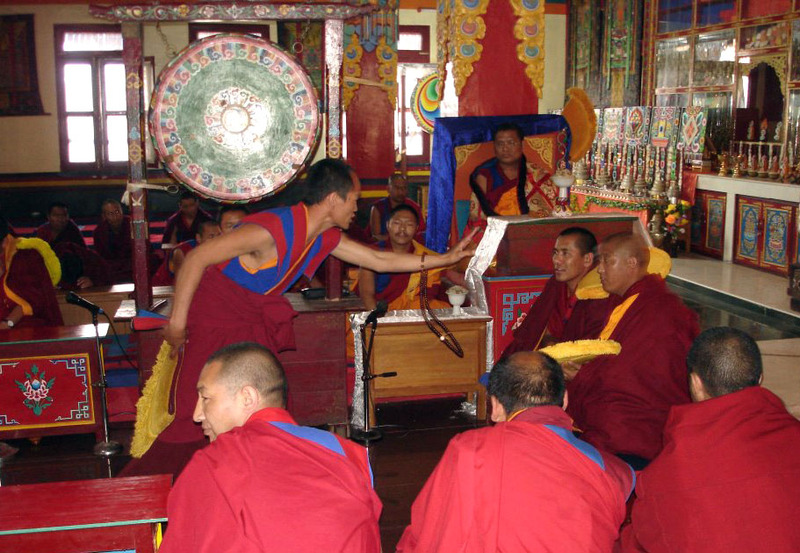 Students who graduate from the dialectic school are awarded the title of ‘Geshe’. Translated, the title literally means ‘Knowledgeable, spiritual friend.’ This degree is similar to a doctorate of religious philosophy in the West but takes well over a decade of study to complete. In addition to the Yungdrung Bön, the Buddhist schools of the Geluk and Sakya also have geshe degree programs. 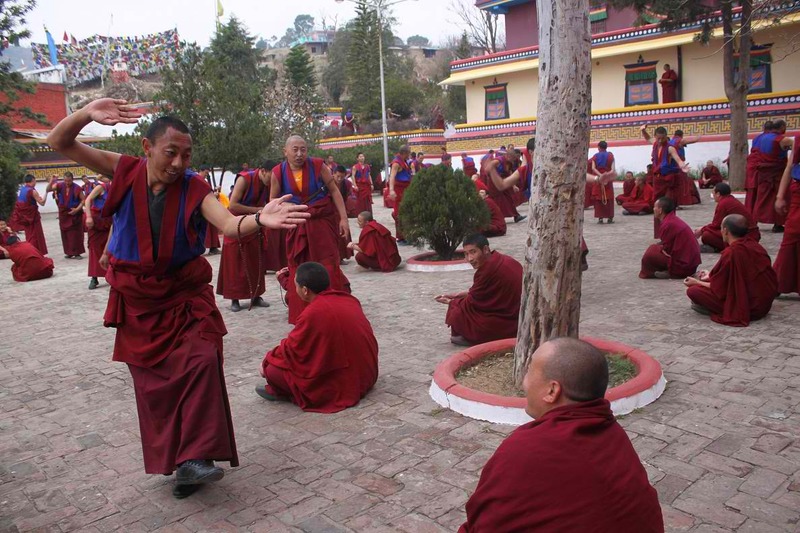 Recently, a geshe program was begun for the Yungdrung Bön nuns of Rayna Menling which is located near Menri Monastery in India. Studies in the dialectic schools are demanding and exacting. Many thousands of pages of text must be memorized and then recited without error in front of one’s teacher. These texts cover a wide range of subjects. Not only supporting the student’s knowledge, this memorization is needed during the debates, a central feature of the dialectic education. In a debate, there is a ‘defender’ (seated) who puts forth a thesis and aims to defend the thesis with statements of truth and without contradiction. The ‘questioner’ (standing) rigorously questions the validity of statements put forth by the defender and aims to lead the defender into contradicting his thesis. Once the proper beginning rituals are complete, the questioner begins the debate by posing a question to the defender which allows them to put forth the statement of their position. In the beginning, the questioner might ask questions in order to further clarify the defender’s position. Once this is clear, the questioner proceeds to try and draw the defender into accepting the truth of statements which will either lead to a contradiction of the thesis or establish a position that is beyond common sense. In formal debates, the defender must answer quickly or the audience will join the questioner in adding pressure to hurry, or worse, openly taunt the defender. If the defender reaches the point of directly contradicting the opening position, the debate is over and the questioner is victorious. However, it is also possible that the defender will put forth an argument strong enough that the questioner is left without a strategy and can think of nothing to say. In that case, the defender is victorious. It is also possible for the debate to conclude without a clear winner. Debates are very physical activities and can even appear to an unknowing observer as quite aggressive. Formal debates can last for many hours and continue until very late into the night. Once the student has passed their final examinations, there are many ceremonies and rituals to be performed which occur over the course of many days. After graduation, many geshes return to their home regions in order to take on positions of leadership and education within the local temple. Others stay at the monastery or travel throughout Asia, Europe and the West in order to offer the teachings of the Yungdrung Bön. 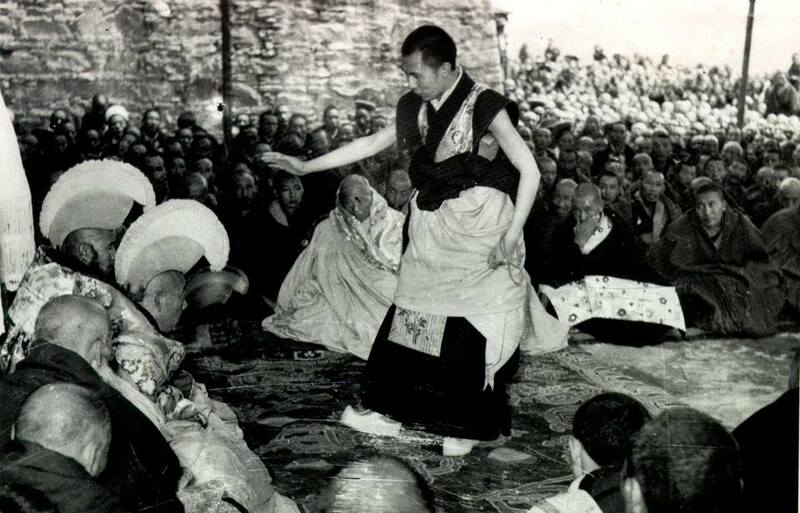 Posted on March 9, 2014, in Tibetan Culture & History, Uncategorized, Yungdrung Bon Monasteries and tagged monks, spirituality, tibet, yungdrung bon. Bookmark the permalink. 3 Comments. Well done Raven- I really enjoyed this post. Losar Tashi Delek to you and Lee. Thank you Jackie. Losar Tashi Delek Pum Sum Tsok!